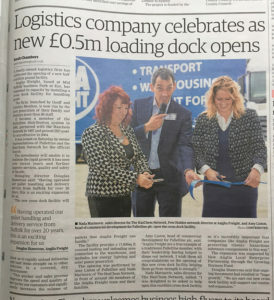 New loading dock for Anglia Freight hits the news! It’s wonderful when one of our clients hits the local newspapers! Anglia Freight, a local logistics company opened their ‘Cross Dock’ this week – a new 17,000 sq ft covered loading area costing them approximately half a million pounds. Not only are Anglia Freight already part of the Palletline distribution system, partnered with Hazchem Network and ISO accredited but now they have further improved their company and extended itself by installing a Cross Dock facility for handling all goods and ensuring that client’s hazardous shipments are fully protected. Last Saturday, our marketing communications team were joined by head representatives from Palletline and Hazchem all wishing to congratulate Anglia Freight on the opening of their very exciting venture. As we are currently working on Anglia Freight’s brand message, being there to help showcase their talents and latest achievement was an absolute dream. Scream Blue Murder brought together a ‘media packed’ team to help ensure Anglia Freight’s story was heard. Within the team were Karin, Andrea, Nick and Chris covering marketing, photography and a PR media release that hit the spot immediately. The service that SBM and their associates provided has been first class. To have 4 individuals with us for a Saturday event showed fantastic commitment and passion to our cause. To then have a whole page spread in the key local paper has helped spread awareness of Anglia Freight tremendously, we are already receiving enquires of the back of the coverage. So, should you need help getting a story that needs telling directly to your clients or making sure the papers hear and shout about you, give us a call on 01379 676720. We will be delighted to hear from you.